ESA astronaut Paolo Nespoli captured imagery of Somalia and the surrounding region from the International Space Station. Update Dec. 12: European Space Agency (ESA) astronaut Paolo Nespoli has spent a lot of time orbiting planet Earth on two tours of duty aboard the International Space Station, and one on a NASA space shuttle mission. He's spending his last month in space soaking up the sights and delivering amazing imagery of Earth. Nespoli is due to return to Earth on Dec. 14 to end his Expedition 53 mission to the station. This month, ESA has been releasing a "Timelapse a Day" of Nespoli images. Check them out here and be amazed at Nespoli's spectacular view of Earth from space. Pacific Ocean coast of Chile and parts of Argentina can be seen. Miami, the amazing blue waters of the Carribean Sea, the Venezuelan city of Caracas and more can be seen in this view. This nighttime pass takes you from Bangkok to Sapporo. Fly over of Europe and Bay of Bengal features auroras and city lights. Nighttime view of auroras and solar panel movement can be seen. Daytime pass of the International Space Station over nothern Africa, Italy, Croatia, Russia and more. The stars auroras “dance” over North America in an unusual look at Earth from space. Imagery of the land "down under" captured by Nespoli. A time-lapse video of the moon rising as seen from the International Space Station was released on the day that Earth was treated to a "supermoon." 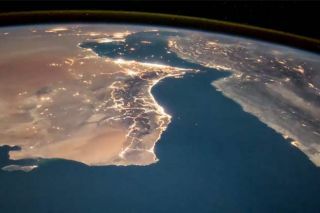 Somalia, the Gulf of Aden, Yemen and more can be seen in this nighttime look. Daytime look at southern California and Mexico from space.